A small and growing town located on a welcoming, active harbour, Ladysmith has a spectacular hill setting, an historic heritage and a large range of activities for residents and visitors to delight in. Named for Lady Smith, wife of a general in the Boer War, since the late 1800s Ladysmith's economy has been based on fishing, coal mining, and logging. Nowadays services and tourism are more dominant industries. Swimming, kayaking and many games take place at historic Transfer Beach, and a huge amphitheatre with live concerts gives visitors an ideal summer experience. Ladysmith has one of the warmest Pacific waters north of San Francisco. In winter, the newly built Frank Jameson Community Centre provides a wonderful pool for swimming and aquafit, dynamic fitness classes and a full gym, as well as a new teen centre and skateboard park. Hiking through the lush green forests of Vancouver Island is a beautiful and uplifting experience on the Holland Creek Trail, the Morden Colliery Trail and several others in the local area. There are two main shopping areas—the heritage downtown core with one-of-a-kind shops offering a variety of products, and further south, the Coronation Mall, with a department store, dollar store, grocery, pharmacy, liquor store, and other services. Restaurants and coffee houses provide Indian, Asian and Mediterranean cuisine as well as the usual sandwiches, soup, hamburgers and pizzas. 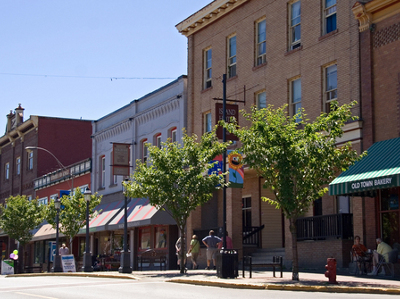 Because Ladysmith is located centrally between two major shopping towns (Duncan and Nanaimo), residents have access to all the resources of a bigger city. At the same time they are close to small nearby towns like Cedar or Yellow Point for a more rural experience. Festivals like the Annual Paddlefest, the Festival of Lights, the Maritime Festival, Ladysmith Days, Arts on the Avenue and the Festival of Lights occur throughout the year for the entertainment of residents and visitors. You can keep up with your movie watching: the Island Cinema brings in first-run movies. The Ladysmith Little Theatre and Yellow Point Players provide year-round live theatre. And baseball games, gardening, seafaring with the local maritime society, kayaking, and learning and producing art are all activities residents can partake in. Artists display their work at The Waterfront Gallery or one of the smaller galleries or stores around the town. Ladysmith is a 25-minute drive south on the Trans-Canada Highway from the Nanaimo Ferry Terminals (Departure Bay and Duke Point). Thirty minutes further south will take you to Duncan, and Victoria can be reached in a 1-1/2 hour drive over the scenic Malahat Highway. Boaters are welcome in the Ladysmith Harbour either at anchor or in a marina. The Nanaimo Airport, with flights coming in and out from Vancouver several times a day, is extremely close. The E&N Railway stops in Ladysmith on its way to Victoria or Courtenay, and regional buses pick up people traveling between local towns 5 or 6 times a day. To date Ladysmith has not had a local bus system, but recent town announcements have indicated that one will be in service soon. Other travel opportunities are available from Nanaimo.